I am a passionate gardener from about March to June every year. It feels refreshing, good for the soul, full of life, and peaceful to push my trowel into the dirt in the cool morning air or in the breezy moments before twilight. During those months, I fancy myself a real gardener as I spread the mulch over the newly weeded flower beds and stand back to survey my plot of earth. Then it gets hot. All my gardening ambition dies. When I weigh weeding in the heat with working in the comfort of air conditioning, my inside work wins every time. So, my gardens transform into jungles as weeds brazenly shove aside my mounds of mulch. Massive spiders take up residence in undisturbed webs. Two years ago, I had an epiphany in July when my gardens were just taking on that forlorn abandoned look. After a quick trip to the Home Depot for a super sale, I toted home some $2 pots of ground covering. 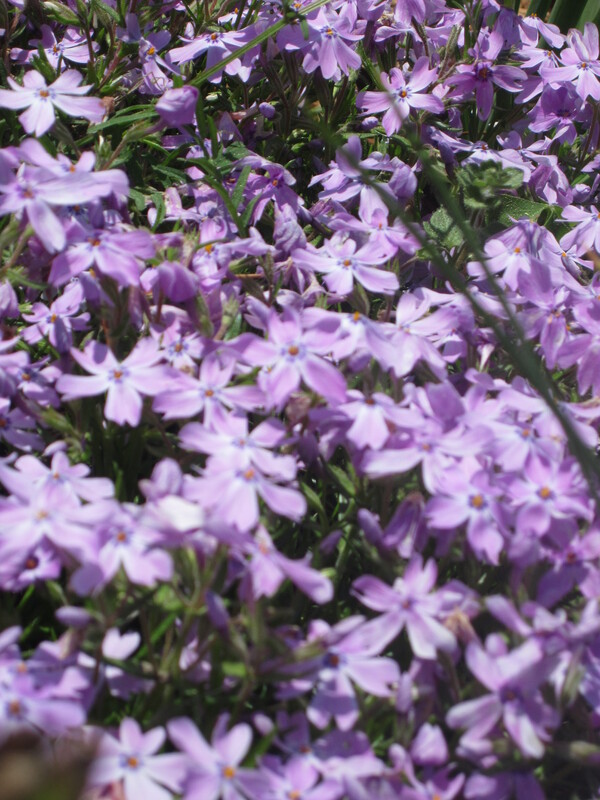 They started small—these tiny plants of phlox and candytuft, but over time I hoped they’d cover the expanse of the garden. And if it worked, there’d be less space for weeds. (Crosses fingers and digs into the dirt). Yesterday, I worked in the flower beds with all my usual spring passion. I fingered the tiny green sprouts just peeking up from the dirt and tried to remember what perennials should reappear in the next few months. 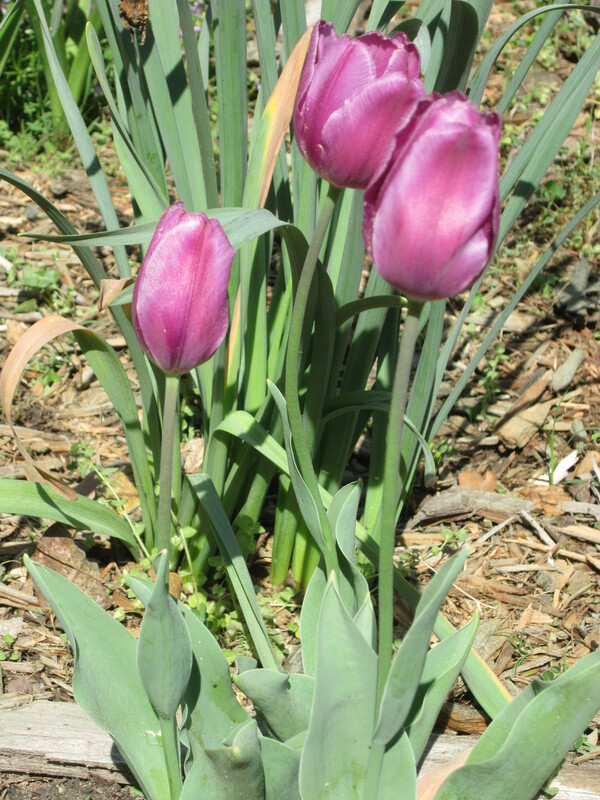 I yanked the viny weeds away from my radiant tulips with their bold colors. In these early spring months, the tulips are the stars of the garden. They are fabulous. They are eye-catching. They are royal show-offs. Next to them, though, are the bright and cheerful phlox and candytuft, the simple plants that have now quadrupled in size. No one has ever told them they are just ground covering and I’m not spilling the secret. Every glance around my garden testified to God’s creativity. The beauty of this world is so vast and varied. And I wondered—is it possible to say that this pure white candytuft, all fluffy and bright, is less beautiful than the deep purple tulip blooming next to it? They are both unique testaments to God’s design. The flowers aren’t bothered by their variety or the specific beauty God’s given them. The tulip rises high and blooms bright, giving glory to God by being a tulip—as it was designed. The candytuft spreads across the ground with simple and sweet blossoms stirred slightly by the breeze, giving glory to God by being candytuft—as it was designed. It’s spiritual gift envy and it’s destructive and dangerous. It takes something beautiful—the variety of spiritual gifts God has given—and twists it into ugliness and pettiness. We might as well trample all over the gardens of faith God has created, stomping on the blooms of others and smashing down their leaves. Meanwhile, others are ramming their big boots down on our own petals. Paul wrote in Galatians, “Let us not become conceited, provoking one another, envying one another” (Galatians 5:26 ESV). That means we will not compare ourselves with each other as if one of us were better and another worse. We have far more interesting things to do with our lives. Each of us is an original. Make a careful exploration of who you are and the work you have been given, and then sink yourself into that. Don’t be impressed with yourself. Don’t compare yourself with others. Each of you must take responsibility for doing the creative best you can with your own life (Galatians 5:26, 6:4-5, MSG). You are an original. So is the person next to you in Sunday School. And the lady who cares for the babies in the nursery, rocking them to sleep. And the guy on the stage singing. And the artist arranging the flowers in the church windows. And the couple who houses missionaries during their visits. And the man who comes early to unlock doors. And the servant who gives his time to set up the chairs for covered dish meals. All of them original, all of them part of God’s amazing design. We can trample all over each other, vying for personal glory, attention, and the best gifts in God’s bag of talents. We can also seek out every opportunity of pointing to the beauty of God in others. Don’t worry if people don’t always see your own beauty. Whether you feel like groundcover or like a tulip taking center stage in a spring garden, you’re blooming for God’s glory. Teddy Roosevelt is credited with coining the adage, “Comparison is the thief of joy.” Whether he said it or not, it’s a truth worth remembering. 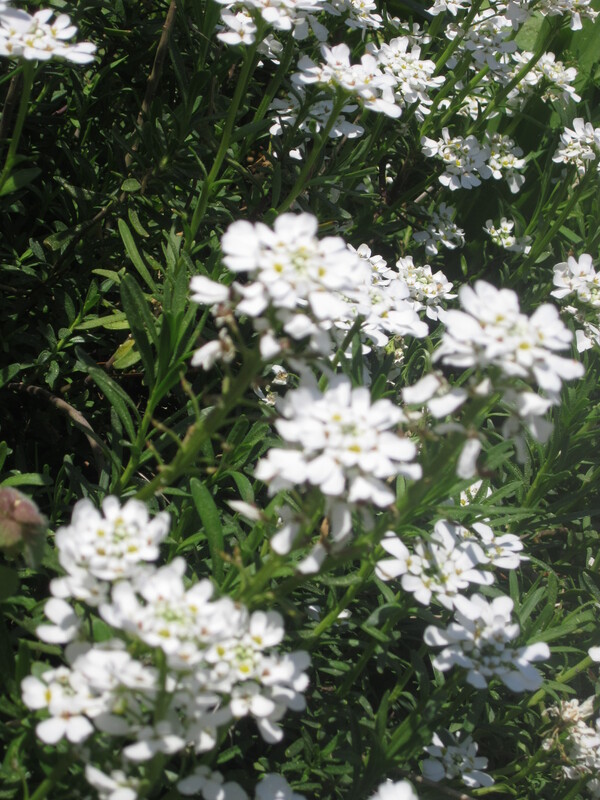 I will have to look for some candytuft for my beds this year – that’s a great idea! (And I too tend to wimp out when the real heat of summer sets in. Suddenly the poolside or inside with the A/C are much more tempting than watering and weeding and swatting the skeeters.) Thanks for the pictures and devotion thoughts. I love that adage. Thanks so much for sharing it! !